We really enjoy our red meat around here. But I can’t stand fatty cuts or meat that is too chewy, so I like to turn to my slow cooker for certain types. One of those is flank steak, which tends to be a tougher cut but almost melts in your mouth after a good sitting in the slow cooker. 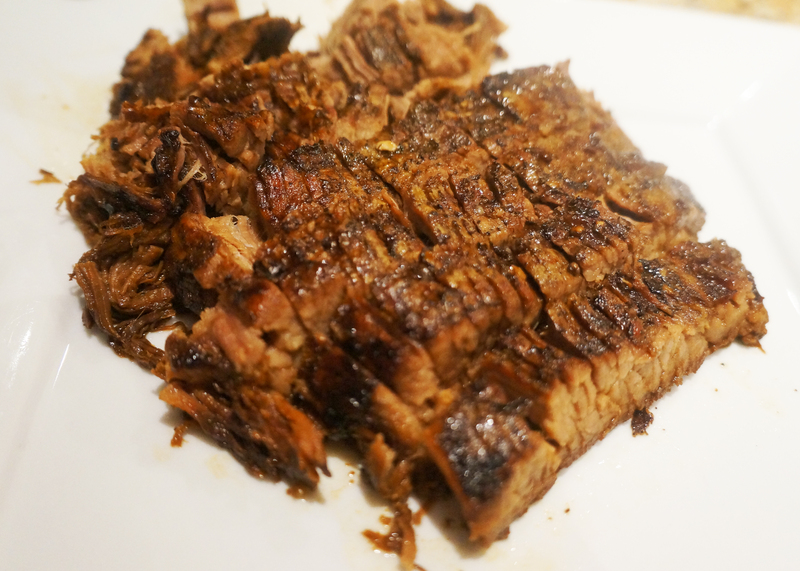 In fact, it gets so tender that even well done, it just falls apart as you cut it. 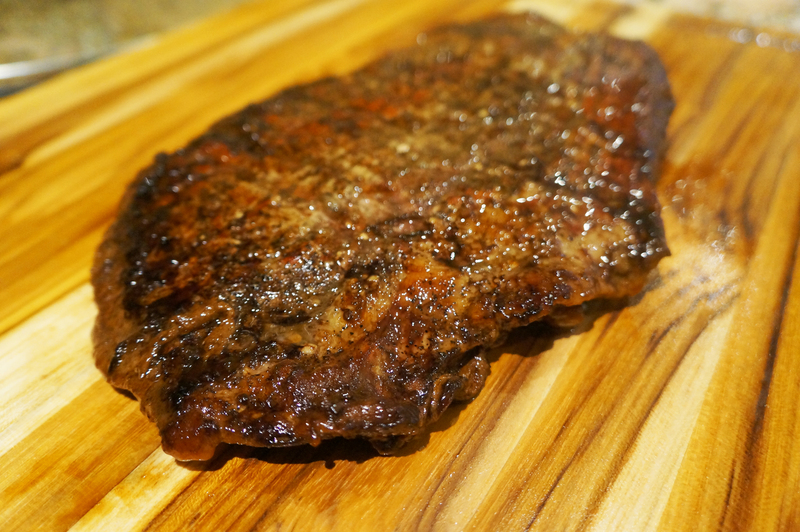 This recipe is for Teriyaki flank steak that I originally found years ago on allrecipes, but have since changed it around. I actually didn’t have any fresh ginger today so I omitted it, and it was still excellent. The trick is to give it a nice sear on both sides prior to slow cooking, and then let it do its’ thing. The best part is, no need to marinate which is great, because I usually forget to do that the night before anyway. So, yay! The result is so, so flavourful and tender, a definite winner with the hubby. In a small bowl, mix the wine, soy sauce, olive oil, sesame oil, brown sugar, ginger, garlic, and pepper. Set aside. Rub the steak with sea salt and black pepper, then heat the oil in a large skillet. Place the steak on the hot skillet and sear on both sides (you don’t want to cook the steak, just give it a nice browned skin). Place in the slow cooker and pour the sauce on top. Cook on low for 6-8 hours (I cooked mine for about 6.5 hours and it was well done, but super tender. Cook for less time if you like it more rare). 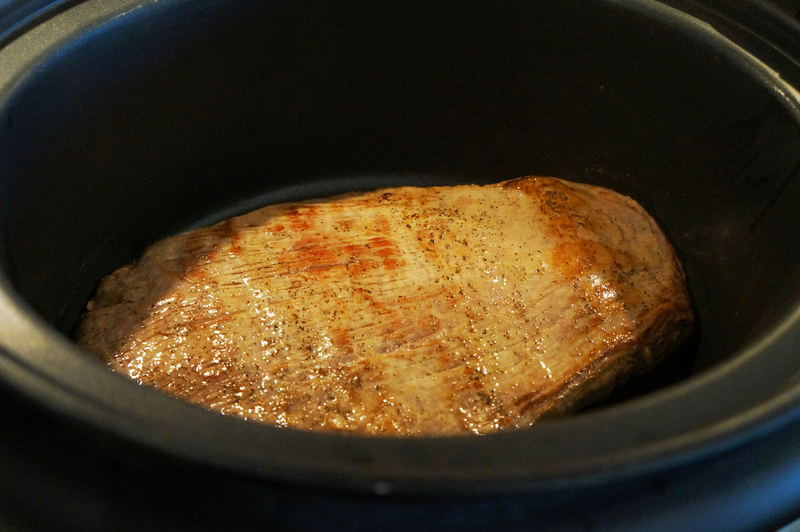 Once cooked, remove from the slow cooker and slice it against the grain, then pour the sauce over to serve. Enjoy! All ready to be sliced up. And how pretty is my new William Sonoma Teak cutting board? It was a bit of a splurge, I’ll admit…but how pretty? « Best ever fried but not fried chicken with spicy honey-dijon dipping sauce – Gluten free! Trying this tonight, cant wait till its done squeeeeeeee!!!! I normally balk at the idea of cooking anything before putting it in the crockpot. I mean, the whole idea (for me) is to be able to throw everything in, turn it on, and leave! No extra dishes to wash. I have found though that you are absolutely right about searing the meat. It makes a big difference in the end result. Searing one piece of meat isn’t so bad. It when the recipe calls for spending 15 minutes sauteing vegetables that I just yell “next!” and move on to the next recipe. I’m making this for tonight’s dinner. I’ll come back and let you know how it turned out! really? 1/4 cup fresh ginger??? That seems like a lot! I thought so too, but it worked! Not a crazy strong ginger flavour. THIS WAS AMAZING!!!! I added some green onions and reduced the sauce a bit after the meat was cooked. OMG, permanently on the weekly menu!! Great ideas! Glad you liked it! Just made it – WOW!!! I used about half the amount of sugar and added a bit of red pepper flakes served over brown rice with broccoli. 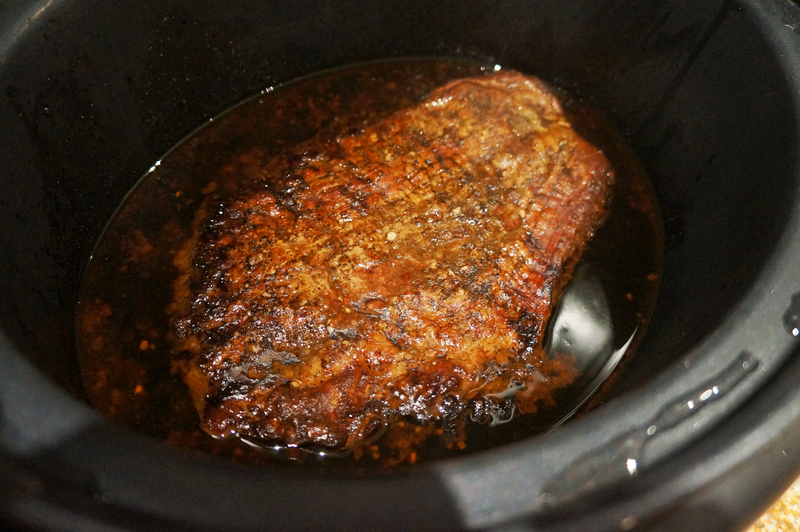 Never had good results with flank steak in the slow cooker before and it’s too cold to grill outside so this was a life saver. The searing helped tremendously. So happy you liked it! The searing really does make a difference. I try to buy the smallest piece of meat I can can find for these types of recipes since it’s just mty husband and myself. What a huge mistake! Now we have no leftovers : (. Incredible flavor. I served it with spicy ginger fried rice and petite baby peas. Instead of flank steak, I used a skirt steak (it’s all they had). And instead of the crock pot, I cooked it in a pressure cooker. (I like instant gratification) So good! Always sear tougher cuts of meat. It seals in the juices, and even adds a bit of flavor. I am doing this now, however, I seared the flank in olive and sesame oil, sliced against the grain, and added to crock. Green onions will be added along with water chestnuts with about an hour cooking time to go. goes a touch faster…. what size crock pot do you have? Not sure I can do this recipe in my 2.5 to 3 quart slow cooker.